WASHINGTON (CNS) — Pope Benedict XVI’s announcement that he planned to resign Feb. 28 stunned and shocked religious and political leaders around the world. From Africa to Europe, Asia and Latin America, Catholic leaders offered warm words of praise and pledged to pray for the 85-year-old pontiff’s health. They pointed to Pope Benedict’s love of the church as a key factor leading to his resignation. “Only a great love for Jesus Christ, for his church and great humility can lead someone to take such a step,” said Havana Cardinal Jaime Ortega Alamino. At the same time, European political leaders recalled the pope for his humble nature and held up his work to unite the people of the world. Cardinal Keith O’Brien of St. Andrews and Edinburgh, Scotland, said he was “shocked and saddened” to hear of the pope’s decision Feb. 11. “I know that his decision will have been considered most carefully and that it has come after much prayer and reflection,” Cardinal O’Brien said. “Yet, on reflection, I am sure that many will recognize it to be a decision of great courage and characteristic clarity of mind and action,” Archbishop Nichols said. “The Holy Father recognizes the challenges facing the church and that ‘strength of mind and body are necessary’ for his tasks of governing the church and proclaiming the Gospel. “I salute his courage and his decision,” he added. The pope’s theological contributions will serve to inspire the Catholic Church throughout Europe and help build the church around the world, he said. “He has laid before us something of the meaning of the Petrine ministry of building up the people of God to full maturity,” Archbishop Welby said. “We who belong to other Christian families gladly acknowledge the importance of this witness and join with our Roman Catholic brothers and sisters in thanking God for the inspiration and challenge of Pope Benedict’s ministry,” Archbishop Welby added. “It was his personal decision. No one can influence him. We are no longer in a world where one can stay in the same position if he no longer feels he is no longer capable of fulfilling his duties. He was very tired. We know that and we saw that,” Msgr. Pelatre said. Archbishop Matthew Ndagoso of Kaduna, Nigeria, called Pope Benedict’s papacy “remarkable” because of his ability of explain, teach and uphold Catholic doctrines and traditions. “He (was able) to stand and defend them come rain or shine and has continue to uphold them as laid down by the founding fathers of the church,” the archbishop said. “This is a tireless job, and he dedicates all his time to the church. It is a decision of faith,” Cardinal Rodriguez Maradiaga said. He told media in the Honduran capital that many of his fellow cardinals had wondered about Pope Benedict’s health. “Although we didn’t know about this, we were thinking ‘How much longer can he be the head of the church? '” the cardinal said. A representative of the Mexican bishops’ conference was surprised by the announcement despite recognizing Pope Benedict’s declining health. “I thought at first, ‘This isn’t true,'” said Auxiliary Bishop Eugenio Lira Rugarcia of Puebla, secretary-general of the conference. During an afternoon news conference, Cardinal Francisco Robles Ortega of Guadalajara said during an afternoon news conference Feb. 11 that during the transition to Pope Benedict’s successor the church will continue to be guided by God. 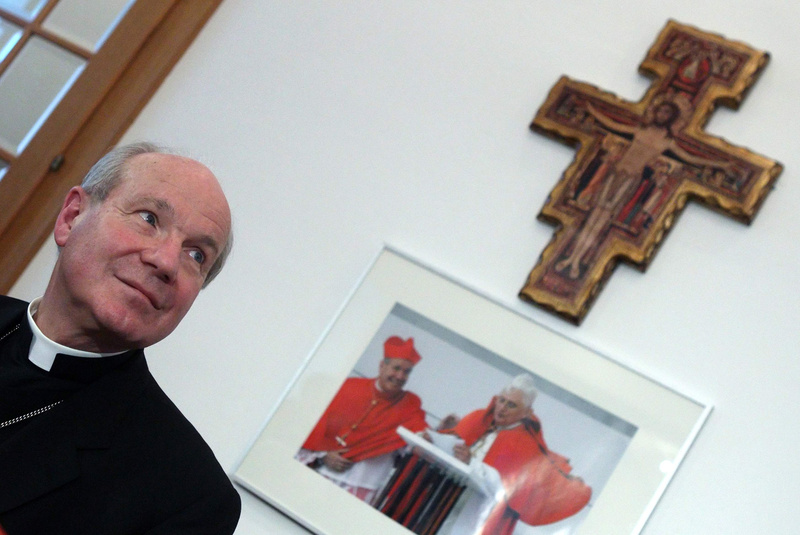 “The church won’t be left in the lurch,” the cardinal said. “As Pope Benedict XVI has said, we are in God’s hands, which are the best hands,” he added. Jewish leaders in Israel credited Pope Benedict for strengthening relations between Jews and the Vatican. Israel’s chief Ashkenazi Rabbi Yona Metzger said the pontiff contributed greatly to reducing anti-Semitism in the world, reported the Associated Press. “I pray that his legacy is preserved and that the trends he led will continue since the relations between the rabbinate and the church during his term were the best ever,” Rabbi Metzger said. German Chancellor Angela Merkel said the pope, a native of Germany, had her “utmost respect” for his decision to resign. “The pope’s words will accompany me for a long time to come,” said Merkel, the daughter of a Protestant pastor. She praised the pontiff for maintaining “a lively interest in the process of European unification” as well as promoting interdenominational and interfaith dialogue. “I wish the best to those who will soon gather” to choose his successor, he said. Canadian Prime Minister Stephen Harper, British Prime Minister David Cameron, and Philippine President Benigno Aquino were among other world leaders who expressed sadness over the pope’s resignation and sent best wishes for his future. Contributing to this story were Simon Caldwell in Manchester, England; James Martone in Istanbul; Peter Ajayi Dada in Lagos, Nigeria; and David Agren in Mexico City.